Summer Studio supports two emerging artists who blur the lines between the creation, installation and exhibition process. Our 2016 resident artists are recent honours graduates from MADA (Monash University Art, Design & Architecture). IMAGE | Emily Yuting Chen, Blinding Gaze, 2016, video still | Image courtesy of the artist. Water sits in a plastic bag inside a box. This box has a light and a screen and a motor. It is a kind of image machine – a technologically defunct projector/viewer of some kind, intended for viewing 35mm slides as if on a television, or in a lab. Here it is attempting to fulfill its mechanised imaging logic – we watch its shudders as it clicks through its loop, only here there is no sequenced narrative of images. Rather, we watch it engage in a time-loop of internal self-imaging, a closed circuit. What are we looking at? Spots, dark in the centre, translucent on the outside, congeal and melt. Slowly, too slowly sometimes to hold my attention. On the wall another liquid image shines, this one looks like molten gold. It shines out of another projector, one that is also imaging itself, or rather its golden light and the analogue index of the drops of water on its internal mirrors. These analogues are super-seductive as images, but that is only part of their purpose. The temporality invoked here through these machine images, resists the narrative continuum of representation, rather it is a temporality created as micro scenes of variable continuities – time understood through waiting for a drop of water to expire, and reform. Emily told me that for her this work was about the horizon – about a line of demarcation between light and its absence, and about an intrusion of light into space. This can be seen in the third projection, a video of a white screen of some sort, tantalisingly offering glimpses of some exterior space – or is it just that we can hear what we think is an exterior and that makes us think there is an outside? All of this comes to end however when we witness what is evidently another machine that is somehow making this image, fall out of the frame. End of loop. This horizon then is one of an eternal return – a repetition that does not offer up a reassuring end, a repetition that does not even have a convincing surety about its own means of production. The matter that forms the content of these images comes with a certain fatal potential for the machines that produce them. And these machines in their flawed and pathos driven mechanicalism deliver this return. Projection/ condensation form a loop. Reflection/anticipation form a loop. They offer us a defamiliarised materiality of the image, one that is neither organic nor a seamless extension of their mechanics. It is a materiality formed in the matter of the repetition of the machine. These two installations by Jordan Mitchell-Fletcher and Emily Chen offer a kind of parallel experience: ground/horizon, dissipation/defraction, kinetics/mechanics. They ask us to consider what comes first: sensibility or materiality? And can we distinguish between these matters/concepts if all thinking is an event of materiality? Fiona Macdonald is an artist and writer, and the BFA Honours Coordinator at MADA, Monash University. 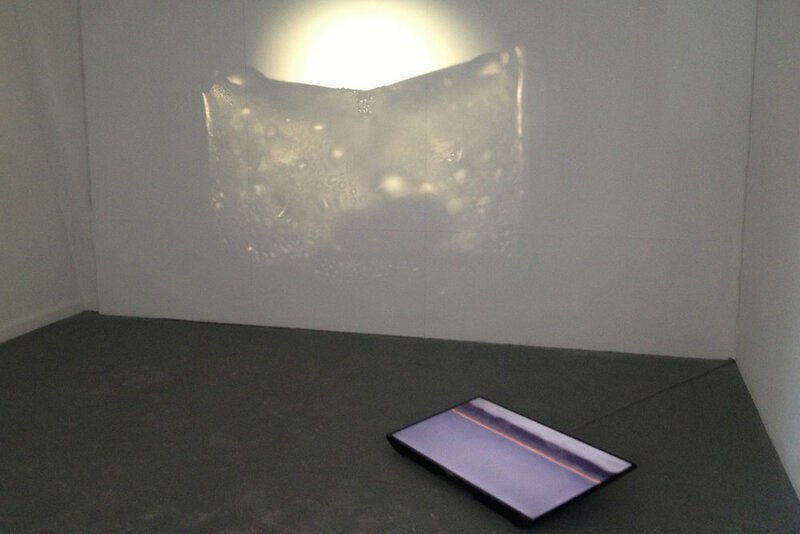 Emily Yuting Chen’s practice explores the property of light reflexively through the mechanism of technological apparatuses such as the slide projector and flatbed scanner. Yuting Chen aims to materialise and sustain the intangible qualities in sensory encounters between forms of technology in part to reflect on the mechanism of human perception. Investigating the abstract language generated during the transmission of one medium to another, the work amplifies what emerges out of this deconstructive exchange – a living system that is generated by its own disintegration.